By teasing out signatures of particles that decay just tenths of a millimeter from the center of a trillion-degree fireball that mimics the early universe, nuclear physicists smashing atoms at the Relativistic Heavy Ion Collider (RHIC) are revealing new details about the fundamental particles that make up our world. Particle collisions at RHIC—a U.S. Department of Energy (DOE) Office of Science User Facility located at DOE's Brookhaven National Laboratory—regularly recreate tiny specs of quark-gluon plasma (QGP), a mixture of quarks and gluons, the fundamental building blocks of visible matter, which last existed as free particles some 14 billion years ago. The collisions free the quarks and gluons from their confinement within ordinary particles (e.g., protons and neutrons) so nuclear physicists can study their interactions and the force that holds them together in the universe today. The new measurements, described in a paper just published in Physical Review Letters, are the first to come from a precision upgrade to RHIC's STAR detector known as the "Heavy Flavor Tracker" (HFT). Specifically, the paper gives details about the first direct measurement at RHIC of how a type of heavy particle containing a "charm" quark gets caught up in the flow of the expanding fireball. This measurement—a testament to the capabilities of the HFT—gives scientists a new window into understanding the interactions of the particles that make up the subatomic soup. "By comparing our measurements with theoretical predictions that include the various parameters that play a role in these interactions—things like the diffusion coefficient (how quickly the charm quarks spread throughout the plasma) and viscosity (how sticky the QGP is)—we can learn about how these different properties relate to one another, and ultimately why the QGP behaves the way it does," said Brookhaven physicist Flemming Videbaek, the project manager responsible for the overall fabrication of the STAR HFT. Particles containing heavy quarks are considered ideal probes for understanding quark-gluon plasma because they may interact differently with the plasma than light quarks do, offering up subtle clues about its properties. But the QGP spits out particles containing heavy quarks only rarely, amid thousands of other particles made of the lighter varieties of quarks. The few heavy particles that do emerge decay into other particles almost instantly—mere fractions of a millimeter from the QGP fireball in which they were created. This rarity and rapid decay make heavy particles difficult to detect. 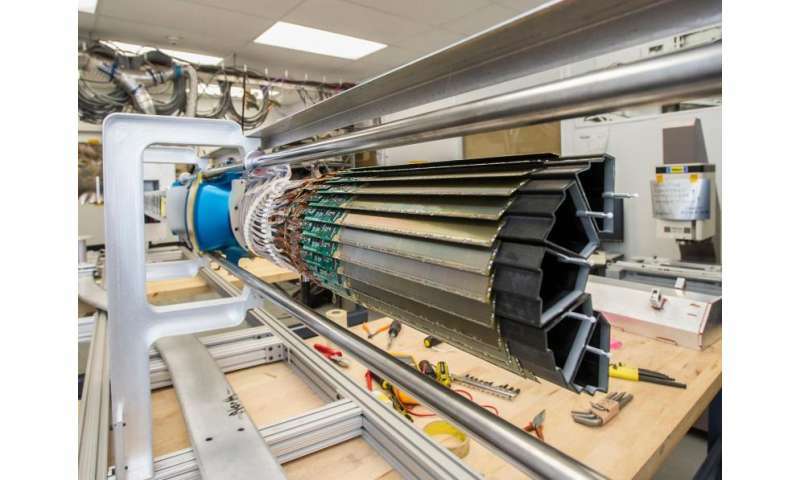 STAR's HFT, a state-of-the-art tracking device now sitting at the center of the house-sized detector, was designed to track the elusive but important heavy particles. 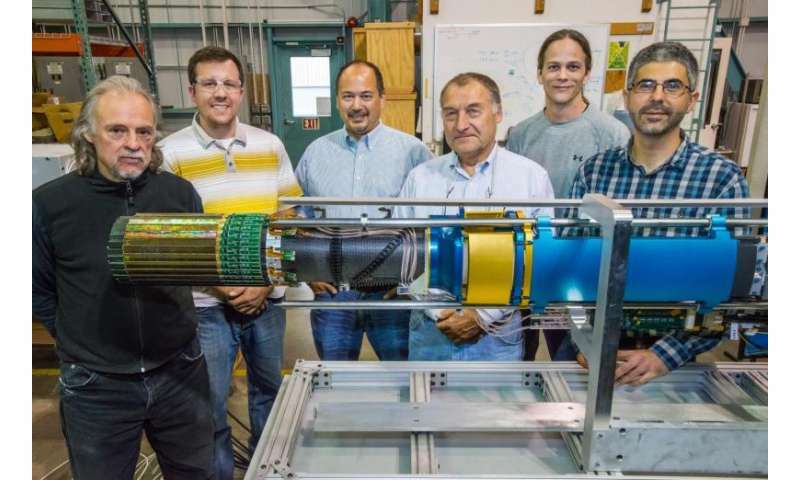 Developed by nuclear physicists at Lawrence Berkeley National Laboratory, the HFT is the first silicon detector at a collider that uses Monolithic Active Pixel Sensor technology—the same technology used in digital cameras. The ultrathin sensors—unlike many of the particle detection components of STAR—sit very close to the central beampipe in which the collisions take place. While not quite close enough to detect the heavy charm quark itself, this location and the detector's high resolution (360 million pixels measuring 20 x 20 microns each) allow it to pick up signs of the heavy particles' decay. For this particular study, STAR physicists were tracking particles called kaons and pions that emerge when charm-quark-containing particles known as a D-zeros decay. A concerted effort from many groups of the collaboration—including researchers from Brookhaven National Laboratory, Lawrence Berkeley National Laboratory, Kent State University, and the University of Illinois at Chicago—made this analysis successful in a short time. "We use the HFT to look for kaons and pions that are very close to one another— within fractions of a millimeter of one another—whose paths from the collision emerge from a single point that's away from the collision vertex, but not very far, about 100-500 microns," Videbaek said. That's the distance D0s travel before they decay, he explained. If the kaon and pion have just the right mass and trajectories emerging from such a point, the scientists can conclude that they originated from a D0 at that spot—and use these measurements to track the emergence of D0s from all around the QGP. "The precision of our measurement is unprecedented," said Xin Dong, a physicist at Berkeley Lab who led the postdocs and students conducting the physics analysis on the heavy flavor results. "It was extremely challenging due to interference from thousands of other particles produced in the same heavy ion collisions—a bit like picking a needle out of a haystack." The findings—based on an analysis of tens of thousands of such "needles" in 1.1 billion collisions—were somewhat surprising. Think of the shape created when two spherical gold ions collide off center forming an oblong overlap—something like a football standing on end. STAR physicists found more D0s emerging from the fat part of the "football" than from its pointy ends. This pattern of "elliptic flow" was familiar from measurements of lighter particles emerging from the QGP. But nuclear physicists didn't initially expect such heavy particles to get caught up in the flow. Brookhaven Lab physicist and STAR collaboration spokesperson Zhangbu Xu noted that the ability to track the flow and diffusion of the heavy particles gives nuclear physicists a new way to "see" and study the interactions of the freely moving quarks and gluons and other properties of the QGP—somewhat analogous to the way scientists from the last century tracked the vibrations of pollen grains in water to learn about its properties. Temperature is equivalent to a potential difference in voltage so it should be possible. I thik you have some catching up to do on what temperature is and how it's defined. Please read some books before making these ludicrous statements.